I won’t say I’m not aware that some marriages are failing these days, but I would not generalize. Just a few don’t make it and that’s sad, but is the reason because women are no longer submissive? Nope. Just because marriage is not 100% dependent on the woman making it work work work, wetin! Marriage is 100% dependent on the couple…each person should bring a 100%. Not even 50-50! Bring your best! People are quick to say “our mothers stayed and made their marriages work but women these days don’t"…have you ever wondered why they stayed? Were they happy? A lot of these women were 100% financially dependent on their husbands for pant, toothpick even sanitary pad! They didn't have the luxury and opportunities women now do. They had to stay and they did for their children, so that they don’t suffer. If they knew they could easily disappear from the scene…chai, some for run. Submission is not slavery. You cannot misbehave in your marriage and expect your wife to "submit". You cannot force submission. If you have issues with your wife submitting to you, check yasef! FOUNDATION – I believe that marriage is God ordained and that is where the foundation of your marriage should be built on. A lot are built on deceit, pretense…e nor go work. Not on looks because beauty fades. Not on intelligence because sometimes all you need is favour . Not on finances because all your wealth can disappear in the twinkle of an eye. Build it on character and the word of God. Old school to some, but it worked in the past, and it is still working. IMPATIENCE - Yes, this is the Instant Indomie generation, everything must happen now now now! Instant happiness! Your husband must hammer, now! Your wife must be submissive, now! Your life must be perfect, now! But I don’t believe marriage is like that, marriage is about the whole process of growth… it’s only when you look back years later that you see how far you've come and grown. Everything good will come. Surulere. SELFISHNESS – The minute you say I do, you should throw all selfishness out of the door; all forms of selfishness. Cheating, stinginess, pride, control, all these behaviors are selfish. It should be about the couple, do what is best for the other and your marriage will flourish. There’s no individual in marriage, na 1 + 1 = 1 still. There are some of the reasons I feel some marriages don’t work, feel free to state what you've observed because there are more! I will add that traffic, no power and the government are also leading causes of divorce in Nigeria. LOL Yes! he is a joker for making that statement. One size does not fit all and i am not surprised that he's of the opinion that the fault lies in women. For crying out loud, this man does not believe in marriage. Why must a woman stay in a loveless and lifeless marriage? Women of nowdays are now reaping the consequence of bringing up children by the women who stayed married by fire by force to abusers. They have grown up to be abusers themselves and they lack respect for womanhood. A woman who stays in a loveless marriage stays because of what people would say and not because of the children. In my opinion, that's selfish. Children needs to grow in a stable environment. 10/10 for this post. Until I got to traffic and electricity. LOL. Great post still! Unrealistic expectation....you think your life would transform magically cause you are married . People dont realise that its what they put in that they get out. Your observations are quite accurate. I also agree with the in law comment. Which is why I m so thankful mine are too far away to just drop by unannounced. Your N1 is on point. The fact that many marriages crash doesn't mean many don't work. I totally agree with you that you don't just give 50-50 in marriage. Each partner has to bring in 100. Another reason why marriages don't last these days is because of the interference of a third party. They say don't let an outsider put asunder what God has joined together. In the past, that outsider is a physical person, nowadays, the outsider is our smartphones and the thousands of followers we have. These days, couples are very quick to share their relationships on social media. It is like we want validation on every single thing we are doing. You have a problem with your partner, instead of sitting down and having a chat about it, we get on facebook, twitter, instagram. That solves nothing. Communication is also key. It saddens me sometimes when I see a couple on a date and they are both busy on their phones instead of connecting physically. If you don't talk, how do you get to know the person you are physically with? You are on point. A lot of men need to know the meaning of submission. In addition, the era of treating a woman ( your wife) like crap just because you feel she cant leave but endure it has passed. Women no longer want to be treated like slaves. Let each person give their best in the marriage! Also, being the right partner is important. As you said, each person should bring 100%, not 50-50. It's not as easy as it sounds, but it's doable. And you are so right, marriage does take time! This is something I'm still learning. Here's something that kept me from giving up on my marriage in the early days when things were rough: "78% of marriages that felt themselves awful 5 years later rated themselves very happy. So if your marriage is in the toilet, don't flush it." - Sheila Gregoire. Hello Sisi Yemi. Great Post, as always. I would only like to add that Marriages did not just start to fail in this generation. What we see today as "Plenty" of failed marriages is only a multiplier effect of failed marriages of the previous generation. When a seed is planted, it does not only bring forth the same quantiy of seed planted. The harvest is usually more than the seed sown. So while its unfortunate that our generation is reaping the fruit of many failed marriages of the previous generation, we are also very fortunate to have at our disposal loads and loads of resources to help us reason better and have a different approach to marriage in order to have successful marriages. Therefore, I strongly believe that all our generation needs to do is leverage on all the resources available to us and ensure that there is a paradigm shift in mindset about marriage. Na truth you don talk so... Its about loving, praying, learning, and mutual respect. You cannot be a bad leader and expect your wife not to rebel...and you cannot on the other hand, take a good man for granted and expect him to stomach it all the time. It takes two to tango, you know. I think this post says it all. Women are more self aware today than ever before. So submission is now cooperation. 50/50 in marriage is today 100/100. Great post. Wow..., all I noticed in the responses is nothing but AGGRESSION, no one even talked about making it work for sake of the kids!! If our mothers were as 'self aware' as we claim to be, will we agree with her if she had left n raised us as a single mom? 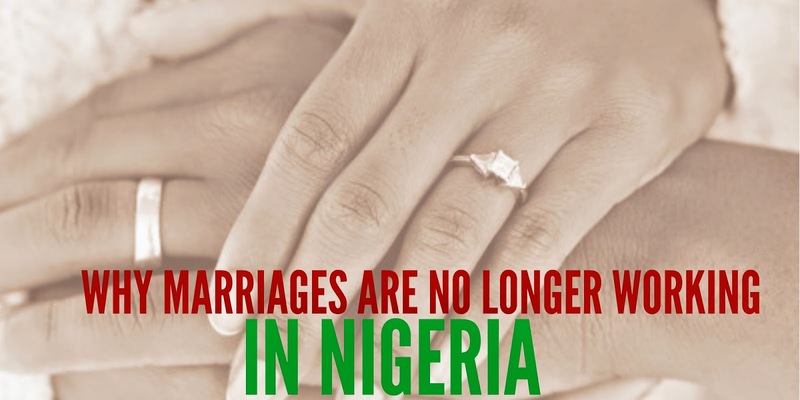 It is wrong to make such a general statement about marriages in Nigeria not working because there are still many marriages that are perfectly working.